I have now moved to Prague. Please find my current webpage here. I am a postdoc (Projectassistent) in the group of Laura Kovács and one of the developers of the automated theorem prover Vampire. Previously, I was a Research Associate in First-Order Theorem Proving and Verification in the Formal Methods Group in the School of Computer Science at the University of Manchester, Manchester, UK. I did my Ph.D. at the Max-Planck-Institut für Informatik and the Saarland University in Saarbrücken, Germany, and at the Faculty of Mathematics and Physics, Charles University in Prague, Czech Republic. A preprint version (including proofs) of our paper Local Soundness for QBF Calculi (SAT 2018) can be found here. Igor Konnov (PI), together with Josef Widder (co-PI) and Helmut Veith (core team), are awarded an ICT research project APALACHE “Abstraction-based Parameterized TLA Checker” by the Vienna Science and Technology Fund WWTF. The 2015 CAV Award is given to Edmund Clarke, Orna Grumberg, Ron Hardin, Zvi Harel, Somesh Jha, Robert Kurshan, Yuan Lu, and Helmut Veith for the development and implementation of the localization-reduction technique and the formulation of counterexample-guided abstraction refinement (CEGAR). 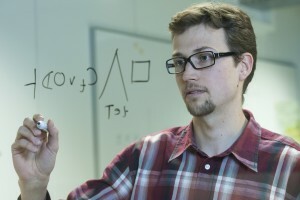 Josef Widder has received his habilitation in computer science from TU Wien. He is now Privatdozent. We had great talks at FRIDA’15 workshop in Grenoble. The slides of some of the talks are available online. Check the program of the 2nd workshop on Formal Reasoning in Distributed Algorithms at FORTE. We have a nice program this year.